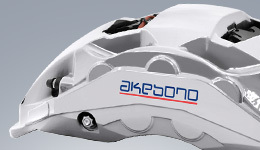 With Our Customers | Stakeholders | Corporate Social Responsibility (CSR) | Akebono Brake Industry Co., Ltd.
“Customers' Needs First” is Akebono's policy of excellence in development, design, production, sales and services we provide. We continuously work to enhance and refine our quality, technology and service to improve customer satisfaction. 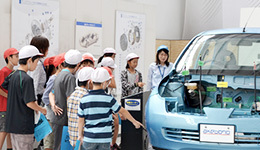 More than 200 training sessions are held each year employing the “Mobile Brake Technology Educational Center,” a vehicle specially designed to display braking mechanisms in an easy to understand way to auto dealers, automobile repair shops and others nationwide to teach car salesmen and auto mechanics about the structure of disc and drum brakes. Points about brake maintenance and market activities are explained using samples and images taken from actual vehicles. Attendees knowledge and technical skills concerning brakes are deepened and their feedback and comments are later reflected in product development. To make customer safety and comfortable driving a reality, we provide training on brake maintenance at brake servicing sites. 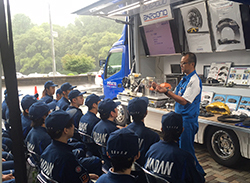 Since 2012, Akebono has provided lectures on brake technology as part of courses at car maintenance schools or schools for aspiring auto mechanics. In fiscal 2017, these classes were held at eight schools in different places throughout Japan. The shortage of auto mechanics is becoming a social issue and we will continue these classes to support their education. In addition, we are also active in conducting associate training, family visits, tours for elementary school students, participating in local community events, and more. Akebono continuously carries out disaster training in accordance with BCM (Business Continuity Management) using earthquake simulations to provide responses to situations escalating from peaceful to emergencies, to ensure the safety of associates, their families and business partners to provide assistance to disaster stricken communities and maintain a stable supply of products for customers. 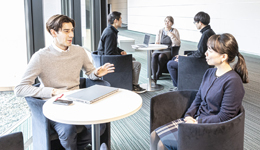 In fiscal 2017, the Company began conducting simulation exercises in an undisclosed format to prepare for a large-scale earthquake hitting the Tokyo Metropolitan area or the Nankai Trough aiming to cultivate emergency response experts. This further enhances BCP (Business Continuity Planning) effectiveness, and the drills confirm that all of the Company's locations, both domestic and overseas, are prepared as well as capable of launching full-scale assistance for local communities in the immediate wake of a disaster. 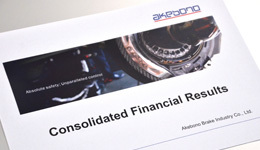 To deliver even better quality products and services to customers, in addition to the ISO9001, the Akebono Group's principal bases nationwide have plans to convert their ISO/TS16949*1 certifications, a set of quality management system standards adopted across the automotive industry, to IATF 16949*2 certifications. In addition, efforts are now under way to acquire the ISO26262*3 certification with regard to automotive electronic and electrical safety-related systems. *1 ISO/TS 16949: Automotive industry standards that seek to improve quality performance and management efficiency. *2 IATF 16949: A new set of automotive industry quality management system standards to replace the conventional ISO/TS 16949. IATF is the acronym for the International Automotive Task Force. *3 ISO 26262: International standards governing automotive electronic and electrical safety-related systems. AAIJ has undertaken a companywide initiative to make various improvements with the aim of enhancing the skills and abilities of each associate and for the Group as a whole. The annual QCC Kaizen Festival was held in January 2018 hosted by TMMIN (PT. Toyota Motor Manufacturing Indonesia) and their cooperative procurement body, the Toyota Manufacturers Club. Two teams from AAIJ exhibited. 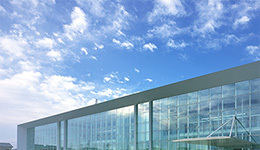 Team TRANSFORMERS, comprised of AAIJ engineers presented improvement initiatives to increase four-wheel assembly line capacity and won the grand prize. At this event, which commemorated its 30th year this year, 150 TMMIN suppliers leverage the results of their everyday QCC (Quality Control Circle) efforts against one another in competition and from among them, 56 teams were selected to exhibit. While continuing to refine skills and abilities, AAIJ aims to become a truly global supplier out of Indonesia. Akebono Brake Corporation was awarded “Best Overall Import Aftermarket Product or Product Line” by the Import Vehicle Community, an automotive group in the United States. This marks the second time ABC has won this award (the first time was in 2014). 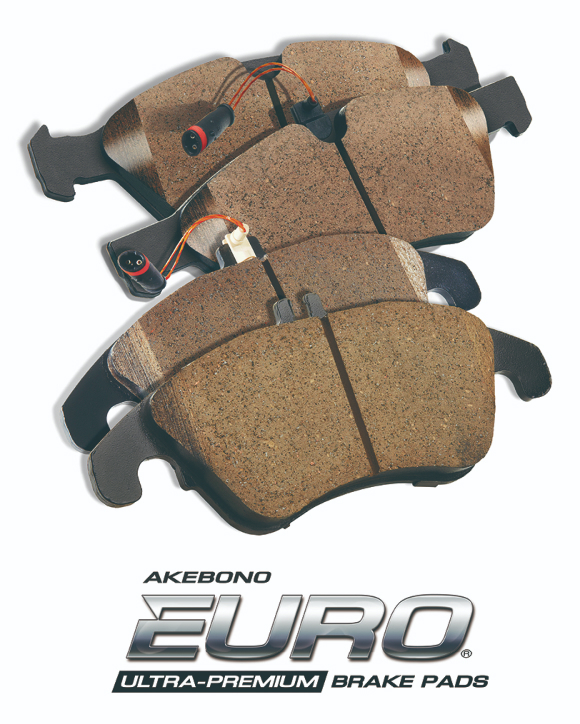 EURO® Ultra-Premium ceramic disc brake pads were designed for European vehicles to realize the excellent braking performance expected in European vehicles, control characteristics and smooth pedal feeling. These brake pads offer the highest levels of performance in terms of reducing noise, vibrations and harshness, which are common problems with brakes. They also drastically reduce brake dust, which helps to keep wheels clean. In addition, these brake pads contribute to the environment by minimizing the content ratio of copper, which is being regulated as a chemical substance in some states in the United States. The product was selected from among hundreds of European car parts sold in the United Stated and honored with this award based on a comprehensive evaluation of its commercial success, quality, level of demand, distribution process, packaging and sales network.